This product is an under sink filter kit for our UltraStream (ionizer not included). It includes everything you need to have easy-access instant clean water without cluttering up your kitchen counter. 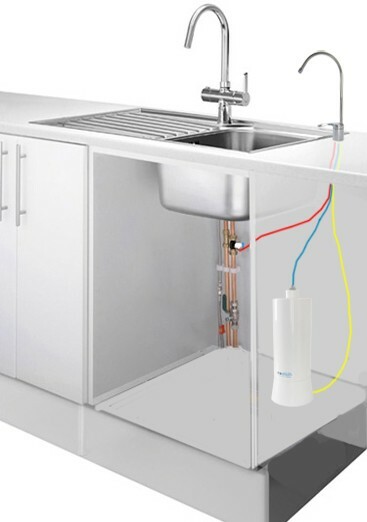 Elegant and easy installation with the UltraStream under sink kit (can also be set up with our additional fluoride/arsenic shield for near-perfect water), no electricity required. Our Under Sink Filter system for the UltraStream (ionizer not included) includes everything you need to create your own under sink inline water filter including a separate filter faucet. This system converts our best selling non-electric hydrogen alkaline water system into an under sink water purifier to keep your kitchen beautiful and your counters free of clutter. Please note: if you have well water please contact us before your purchase. 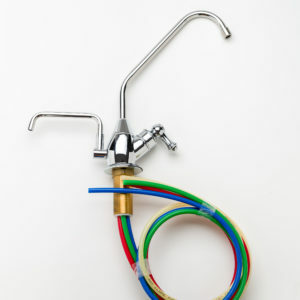 The system includes everything you need except the actual under sink filter or ionizer. We recommend the Ultrastream H2 Water Filter System which is shown in the photos. AlkaWay and Best Water Inc. cannot be held responsible for under the sink installation of the UltraStream. But we’re very happy to provide guidance via the telephone to help you with the installation. THE ULTRASTREAM IS DESIGNED FOR MUNICIPAL (TOWN) WATER SOURCES. IF YOU ARE CONTEMPLATING USING THE ULTRASTREAM WITH WELL WATER, PLEASE CONTACT US. WE ALWAYS RECOMMEND THAT YOU HAVE A TEST PERFORMED FOR BORE WATER FIRST SO WE CAN HELP YOU BEST.